If you respect God, then you will obey Him. My friend, this is absolutely good advice for life; respect God! 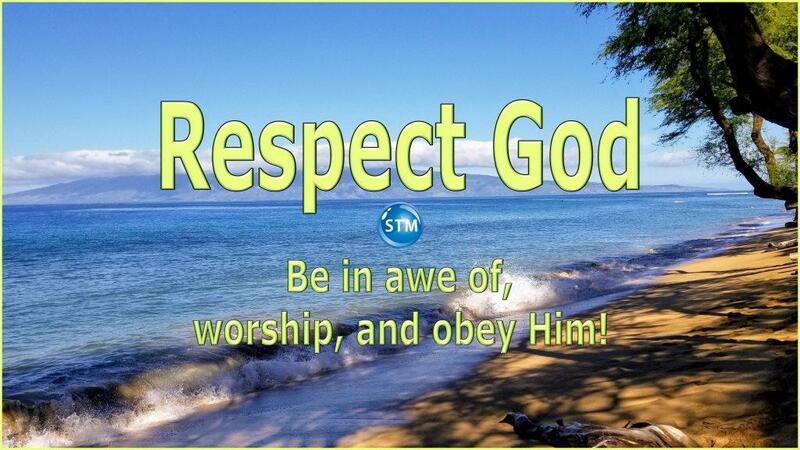 Respect God – Be in awe of, worship, and obey Him! Have you ever thought about this question “do you respect God“? To be clear, do you think God is worthy of worship and obedience? To respect God means you admire Him with praise and love, mixed with awe and/or fear. When you respect God, you worship Him. You honor Him by doing what He says. For this reason, we should give attention to and respect/fear of what God can and will do. Those who want wisdom respect God. Wisdom begins with respect for the Lord, and understanding begins with knowing the Holy One [Proverbs 9:10 (NCV)] ♦ If you really want to become wise, you must begin by having respect for the Lord. All those who follow his rules have good understanding. People should praise him forever [Psalms 111:10 (NIRV)]. Show that you fear and reverence the Lord by the way you live. The Amplified Bible (Classic Edition) says “walking in the respect and reverential fear of the Lord“. And so it came about that the Church, throughout Judea, Galilee, and Samaria, enjoyed peace and became firmly established; and, ordering its life by reverence for the Lord and the help of the Holy Spirit, it increased in numbers [Acts 9:31 (TCNT)]. 13 for it is God who is at work in you, both to motivate the desire and to carry out what pleases Him [Philippians 2:12-13 (AUV)]. Under grace, through Jesus, the focus is the love of God. Love gives the power to control (self) and avoid sin. Only those who continue in sin need to fear. Respect is to take notice of; to regard with special attention. To honor and act toward with due regard (worship). As such, the child of God shows respect for God by doing what He says. G5401 respect in this verse is from the Greek word φόβος phobos (fo’-ɓos) n. reverence, respect (for authority, rank, dignity); KJV=fear. Reverence is to regard with fear mingled with respect and affection/esteem. It is deep respect and high regard mixed with fear and love. G127 reverence is from the Greek word αἰδώς aidos (ai-d̮ōs’) n. 1. (towards God) awe. 2. respect. Respect God – Show respect to all men. Love the Christians. 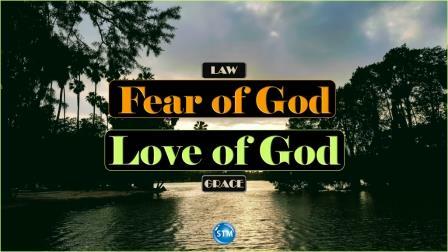 Honor God with love and fear. Respect the head leader of the country. Honor, when used of the Lord, is to reverence; to adore (to honor as God or as divine); to worship (to perform acts of praise or respect). Some of the teachers of the Law and the proud religious law-keepers from Jerusalem came to Jesus. They asked, 2 “Why do Your followers not obey the teaching that was given to them by our fathers? They do not wash their hands before they eat.” 3 Jesus said to them, “Why do you break the Law of God by trying to keep their teaching? How do we honor God? The lofty looks of man shall be humbled, and the haughtiness of men shall be bowed down, and the LORD alone shall be exalted in that day [Isaiah 2:11 (KJV)]. The Lord chose YOU to be set apart for Him (i.e., be holy). So I urge you to honor God. Live so that He will receive praise through you (Ephesians 1:12). One of the best ways to show that you appreciate God is to obey Him. When you obey God, you submit to His authority. You meet the requirements given in the Scriptures. Above all, it is to freely agree to fair limits and control. So be obedient as a faithful servant. Now you are free from sin and are servants to God. You have your fruit in holiness, and the end everlasting (eternal) life. 23 For the wages of sin is death, but the gift from God is everlasting life through Jesus Christ our Lord [Romans 6:22-23 (NSB)]. Worship the Lord, all the earth! Honor him, all peoples of the world! 9 When he spoke, the world was created; at his command everything appeared (GNT). I cannot stress the importance of the fear of and respect for God; it is absolutely good advice for life. Learn to fear, honor, worship, obey, and respect the Lord and be blessed—♥ Tim. Note: parenthesis (#) enclose the key verses. Ecclesiastes 12:9-14 (13-14) [references: 2 Corinthians 6:11-7:1 [6:14-7:1; (6:16-18 and 7:1)]. Luke 12:4-7 ( 4-5); Proverbs 9:10-12 (10); Psalms 111:10; Acts 9:31; Philippians 2:12-18 (12-13). Jeremiah 5:18-31 (22 and 29); 1 John 4:17-19 (18); 2 Corinthians 7:1; Hebrews 12:25-29 (28-29). 1 Peter 2:13-17 (17); Matthew 15:1-20 [(8-9) compare Mark 7:1-23 (6-7)]; Revelation 4:1-11 (11). Isaiah 2:1-22 (10-11); Hebrews 12:3-11 (7-11); Romans 6:15-23 (22-23); James 1:21-27 (22). 1 Peter 4:12-19 (17-18); Psalms 33:1-15 (8-9); Ephesians 1:3-14 (3-4). 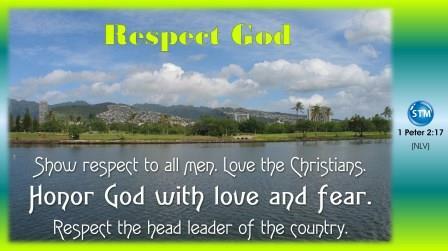 ♥ Question for ‘respect God’: Do you fear, honor, worship, obey, and respect GOD with love? Scripture quotations marked (CEV) are from the Contemporary English Version Copyright © 1991, 1992, 1995 by American Bible Society, Used by Permission. || (ERV) Taken from the HOLY BIBLE: EASY-TO-READ VERSION © 2001 by World Bible Translation Center, Inc. and used by permission. || (GNT) and (TEV) Scripture quotations marked (GNT) are from the Good News Translation in Today’s English Version- Second Edition Copyright © 1992 by American Bible Society. Used by Permission. || (ICB) Scripture taken from the International Children’s Bible®. Copyright © 1986, 1988, 1999 by Thomas Nelson. Used by permission. All rights reserved. (NCV) Scripture taken from the New Century Version®. Copyright © 2005 by Thomas Nelson. Used by permission. All rights reserved. || (NIRV) Scriptures taken from the Holy Bible, New International Reader’s Version®, NIrV® Copyright © 1995, 1996, 1998 by Biblica, Inc.™ Used by permission of Zondervan. www.zondervan.com The “NIrV” and “New International Reader’s Version” are trademarks registered in the United States Patent and Trademark Office by Biblica, Inc.™ || (NKJV) Scripture taken from the New King James Version®. Copyright © 1982 by Thomas Nelson. Used by permission. All rights reserved. || (WE) Taken from THE JESUS BOOK – The Bible in Worldwide English. Copyright SOON Educational Publications, Derby DE65 6BN, UK. Used by permission. Pingback: Faithfulness in the Time of Little Faith in God; Are You Faithful? To respect God means you admire Him with praise and #love, mixed with awe and/or fear. Do you… #respectGod. Now loads better on mobile devices ? we love you! ? Ecclesiastes 12:13-14 Now, what should we learn from everything that is written in this book? The most important thing a person can do is to respect God and obey his commands, because he knows about everything people do—even the secret things. He knows about all the good and all the bad, and he will judge people for everything they do. Visit the full Bible study; click on/tap the picture or link. Never #envy people that do not #respect or #worship #God. They may have the things you want but all of it will perish. What you have with the #Lord is far more precious! Proverbs 23:17-18 Never envy evil people, but always respect the Lord. 18 This will give you something to hope for that will not disappoint you.